One of my favorite parts of creating 3D clothing is trying to make the cloth look and act like it does in real life. Take my new dress BMe Elegance. The fabric is meant to look and act like silk paper taffeta. Taffeta by nature is very lightweight and crisp but what makes paper taffeta wonderful is it acts like paper. When you crumple a piece of paper it stays just how it is until you smooth it out. Well the same with paper taffeta. The silk fibers are both dull and shiny creating an interesting way of reflecting light. Needless to say I spent a long time in Photoshop trying to convey all of the above qualities so they are visually apparent on the texture of the dress. I hope you like it. One never know what secret tricks are hidden in the complex makeup of a blog so I thought it would be fun to do a bloggers class, Blogging 101 via world press. Over the next few weeks I’ll be posting my assignments. Today I am to introduce myself and share why I blog. In the virtual world of Second Life I am Solas Na Gealai, galic for moonlight. In 1999 I was diagnosed with young onset Parkinson’s disease. Four years later I was forced to retire from a very stressful but loved career as a fashion designer, That shattered me, I felt lost and useless until 2007 when I discovered Second Life, for someone like me it was a dream come true. Although energy and time for health reasons is limited, I taught myself the art of content design for 3D platforms, with it I combine my love of period costumes and fine art to make immersive fashion for others to use. My blog and virtual shop is a reflection of that love. This dress was crafted in a program called Maya, Textures for the 3D Item was created in Photo Shop. Items were uploaded into Second life, worn by Solas to give us the final rendering. Lots going on at BMe this July, to start with . 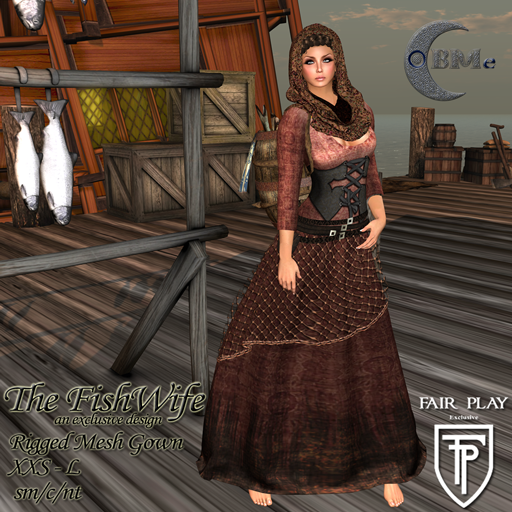 . .
For the month of July you can buy the BlueMoon enterprise’s Exclusive design “BMe FishWife dress” for only 250L$ once it’s gone from this event it will be gone from Second Life forever. made exclusively for Fair Play July event. Fair Play’s El Mundo is a permanent fantasy fairs with designs, inspired by games. Fair Play stands for regularly change. Every day is a bit different! The fairs are all permanent. Designers can rent stall and stay as long as they like. Each designer is asked to offer a new exclusive release a month, meaning once the item is no longer at the event it is gone from SL forever. To aid to the creativity of each designer the event has no drop dead date for the arrival for the new creations. Making each day you visit Fair Play’s El Mundo’s selection of product, like the weather, every day is a bit different! Fair Play’s El Mundo is a permanent fantasy fairs with designs, inspired by games. Be part of the beautiful Celtic design representing each of the 4 seasons in the landscape. Please make a note not to miss the four large temples in each corner housing each of the events sponsors.